It took four days and 25 minutes of a fifth day for an apologetic Phil Mickelson to win his 50th career title at the weather-affected AT&T Pebble Beach Pro-Am. Mickelson and England’s Paul Casey returned to Pebble Beach at 8am Monday morning local time after the Sunday 16th hole ‘stand-off’ between the duo 14 hours earlier. With just two holes to play and a three-shot lead, ‘Lefty’ was adamant he could see in the closing darkness and wanted to go on while Casey said he couldn’t read the three-foot putt he was staring at in front of him. Common sense prevailed and the PGA Tour called an end to play. Casey returned in bright Monday morning sunshine to hole the putt to remain three behind Mickelson with the duo then going on to both par the 17th hole. 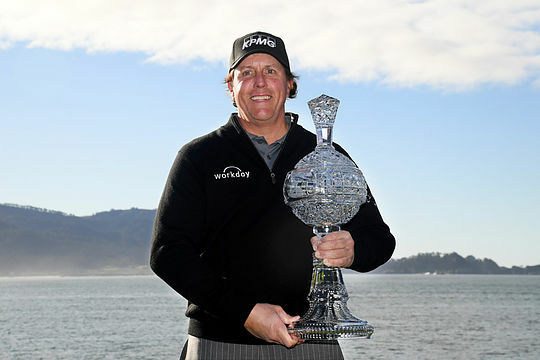 While the Englishman was hoping for a miracle at the final hole, 48-year old Mickelson became the oldest-winner of the Pebble Beach event after sinking a final hole birdie for a closing round 65. Casey, who had led by three shots heading into the final round, also birdied the 18th hole to secure outright second place with a 71 for a 16-under par total. “I thanked Paul this morning for having us finish this morning because I get sometimes in my own little bubble that I don’t see the big picture and he really protected both of us as the greens last night were beat-up so to come out today on fresh greens, better weather and be able to see a lot better made me better appreciative of that,” said Mickelson. Casey not only captured his best finish since winning last March in Tampa but he and his amateur partner won the team event. “I was trying to win the regular tournament, as well, so this was also a big goal to win the team prize and with hats off to Phil on a deserved win, I am just go glad to get second on my own,” said Casey. Jason Day lead the Australian field finishing in a tie for 4th at 13-under adding to his T5 at the Farmers Insurance Open and placing him in contention for a spot on the Presidents Cup International team. “That’s one thing that you want to be able to do is represent Team International and especially represent your country down at home. And Royal Melbourne is going to be a phenomenal joint again and we’ll have a lot of fun,” said Day. The Australian hasn’t finished outside the top 20 this season on the PGA Tour and with three results inside the top 5, he is surely close to securing yet another victory. Curtis Luck shared 28th place at 6-under with Matt Jones (T53) and Cameron Davis (T59) the only other Aussies to make the cut.